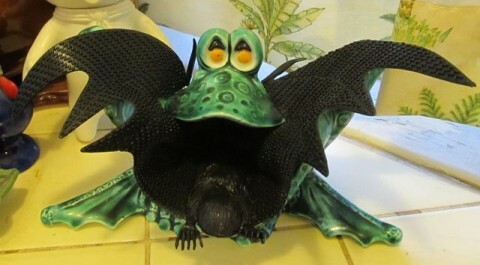 Bizarre Sighting: Ceramic Toad Swallowing Cheap Novelty Bat Caught On Camera! LOOK CLOSELY and you’ll realize that this is a rare, and perhaps first, sighting of a sink toad feeding on a rubber bat. Yes, this happened. This amazing photo was taken over the kitchen sink by me. What happened was I was trying to get a head start on decorating the house for Halloween. I hung the rubber bat on a hanging plant hook in the ceiling. Evidently the cheap elastic string broke and the bat fell down into the waiting maw of the hungry sink toad. Sink toads usually feast on scouring pads or sponges, but they are notoriously opportunistic feeders, even swallowing the occasional dish rag or Clorox wipe. After struggling with the meal for quite some time, the toad eventually gave up and spat the bat out. 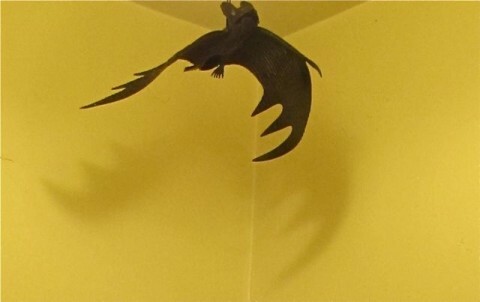 The bat recovered enough to have its elastic retied and rehung in a different part of the house. 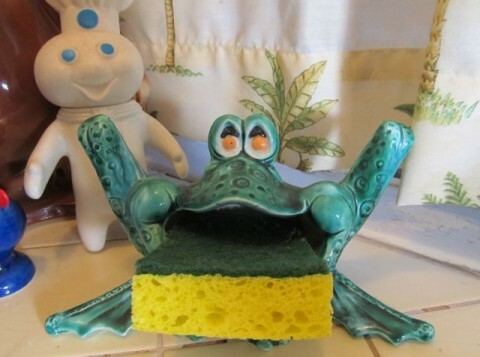 The toad, or hideous ceramic frog as it is technically known, is an invasive species from a local thrift store that took up permanent residence in my house two years ago after it was listed on eBay with no bids. I guess I overestimated the online market for ugly scouring pad holders. I’m sure I won’t make that mistake again. Posted by Ted on September 26, 2013, 10:39 PM.